Did you know that in the Southern portion of the US a New Year’s tradition is to enjoy some Black Eyed Peas on New Year’s Day? 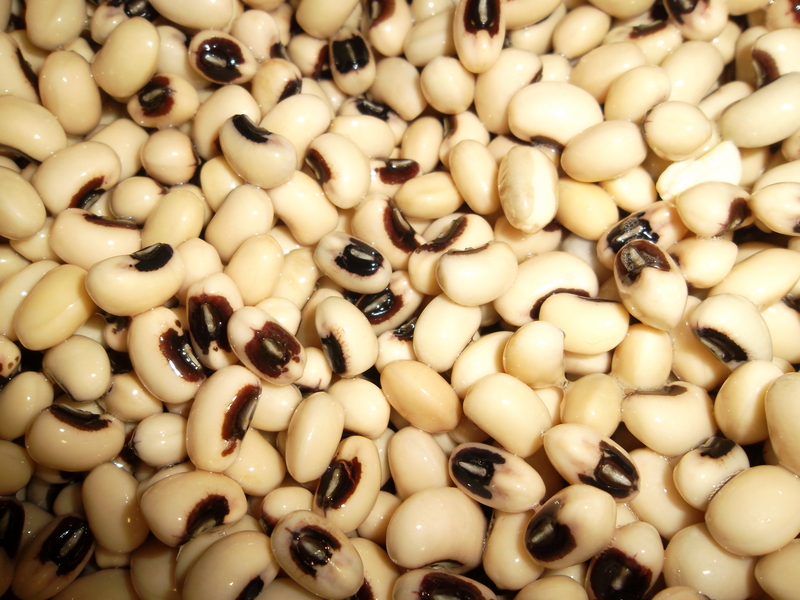 The tradition dates back to Civil War days and is said to bring good luck for the year to come for those who enjoy some Black Eyed Pea goodness on January 1st. Find us a Black Eyed Pea recipe to enjoy. 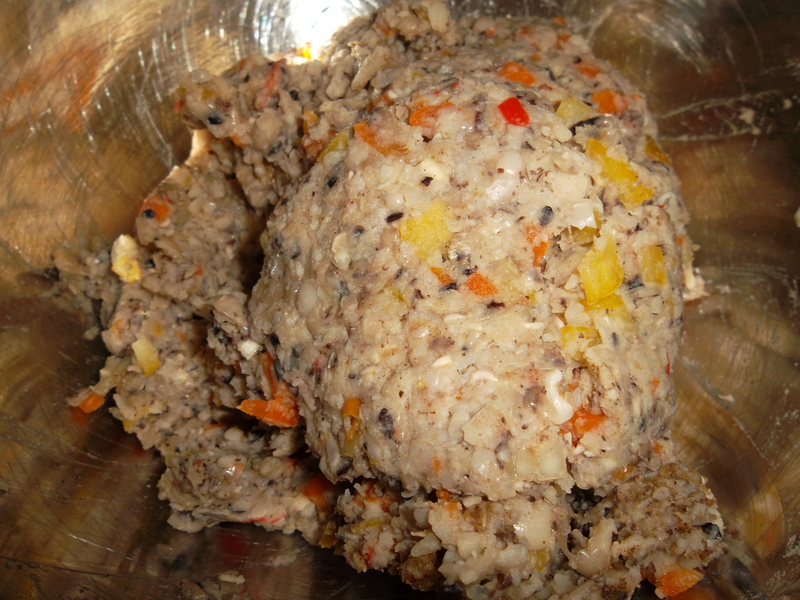 With Step 1 accomplished we came across a Cooking Light recipe for Black Eyed Pea Patties that suited our Step 2 needs. We made some change ups to the recipe to suit what we had on hand and one of our distaste (Tara’s) for cilantro. Because our BEP were dry we had to take two steps before we could get to cooking. First, we soaked the peas overnight in water. Second, we rinsed the peas and put them in a pot with water to cover, brought the water to a boil and than simmered the peas for 45 mins or until soft enough to mash. While your peas are cooking you can get to chopping. First the garlic and the chili peppers. As we’ve mentioned before we LOVE us some garlic around here, so the more the merrier in just about any recipe. This time we were cautious of our patty ratio, so we used the 3 cloves this one called for. Once minced, add your garlic and chilis to your bowl of soft, rinsed and well drained peas and mash them together. You can use a food processor if you’re lucky enough to have one. We don’t own either a processor or a potato masher in our kitchen yet so we made our pastry blender work for the job. 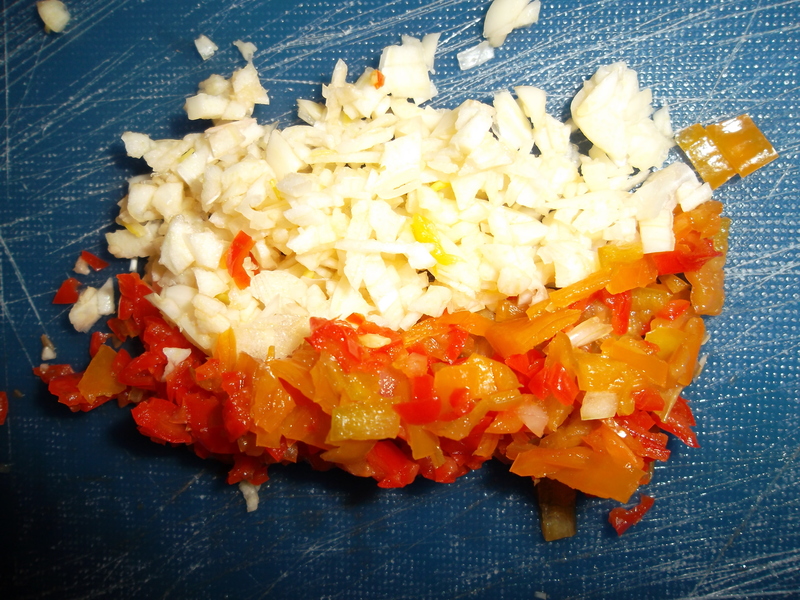 If you’ve got two chefs in the kitchen like we do, one of you can be mashing while the other is chopping up the next ingredients: sweet peppers and onion. 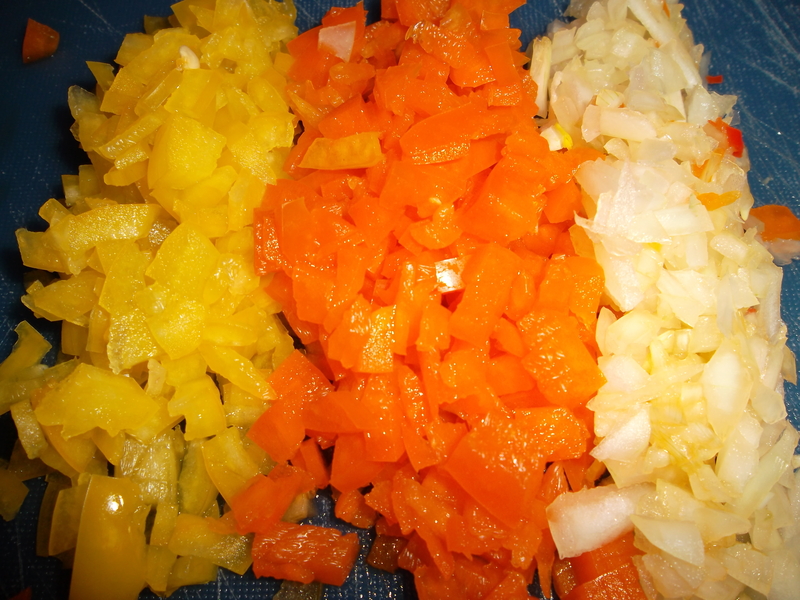 We used yellow and orange peppers for our mix. Take your mixture (recipe says divide into 12 equal portions about 1/4 cup each). We hand formed 10 patties and were a little less formal about it. 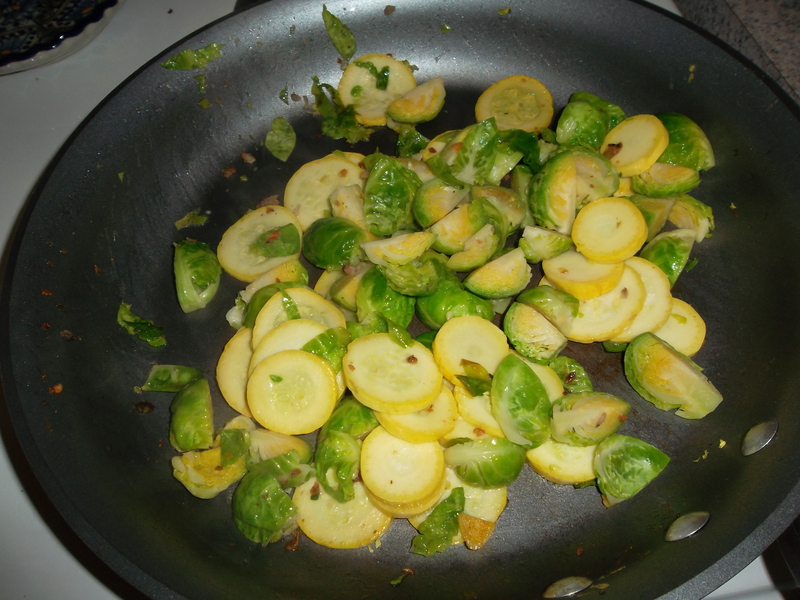 Heat your olive oil (enough to coat a large non-stick skillet) over medium high heat. Depending on your pan you should be able to cook about half of your patties. Ours took about 5 minutes on each side to brown. 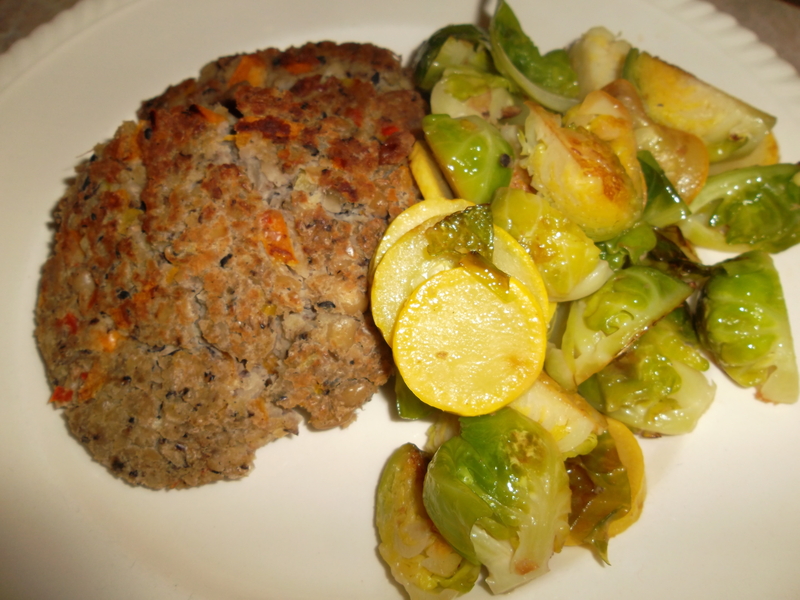 We made a side dish of yellow zucchini and Brussels sprouts sauteed with garlic to go with our patties. Sidenote: We enjoyed a little zucchini relish with our patties in place of the garlic pepper salsa that came with the original recipe. A salsa or ratatouille would be delicious on top of these patties. Or maybe in a burger bun with all the fixin’s. We enjoyed our delicious New Year’s meal that we’re hoping is chalk full of good luck for 2012. Whether you enjoy Black Eyed Peas for the New Year or if you try this recipe sometime later they are tasty and not too difficult to make. We are planning to try left over patties with an egg fried over medium on top for our January 2nd breakfast tomorrow morning. ~ That is some good 2012 eatin’ folks!